Last weekend, some friends and I rode from San Francisco through Sausalito to Tiburon. We stopped for food in Sausalito and again in Tiburon after we just missed the 16:20 ferry at Tiburon. This was my first time taking my camera along for the ride, so I got to play around with a couple things I had noticed the first few times I had gone. 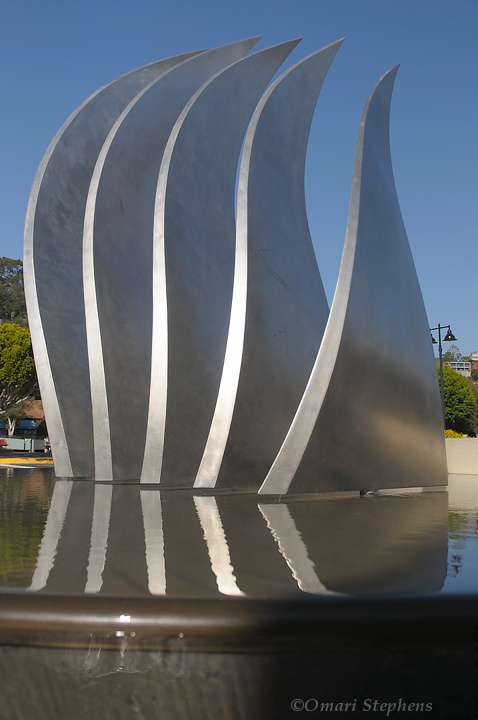 This statue is in Tiburon, close to where the ferry stops. I'm always surprised at how few people seem to notice it, because it's pretty stunning; it's clear that a lot of thought went into it. 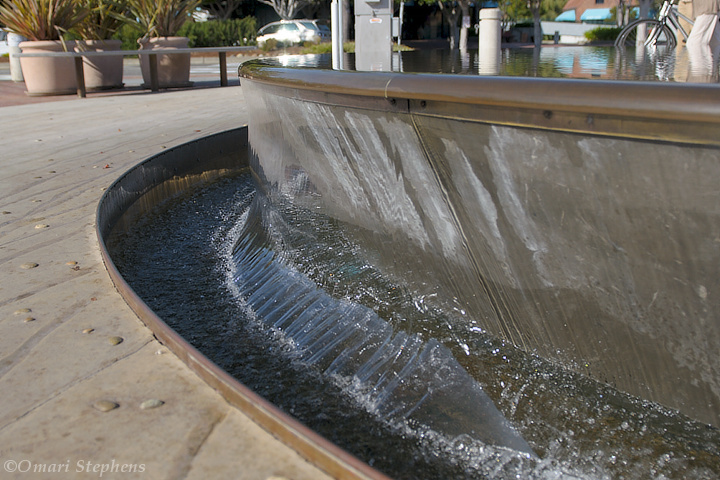 It's also a motorized dynamic sculpture — the fins turn back and forth in unison. And the overflowing mirror pool is a great touch. One aspect of the trip that I especially noticed this time was the omnipresence of birds. They were everywhere, all the time. 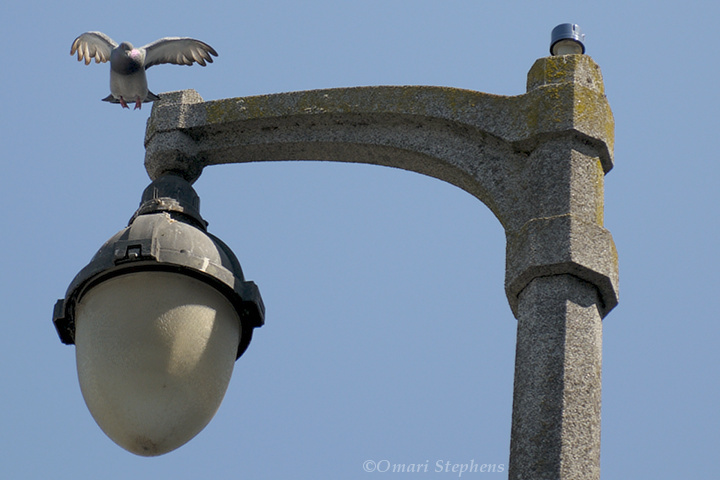 During our stop in Sausalito, I managed to get this shot of a pigeon jumping off of a lamp-post, but before it started flapping. 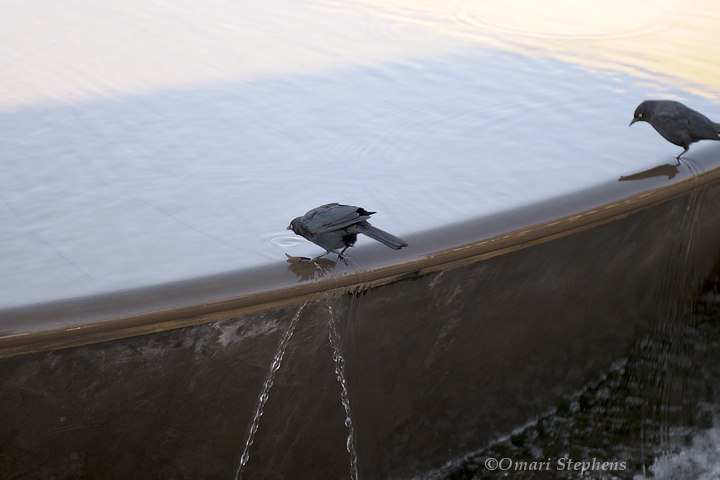 And in Tiburon, there were birds sipping from and bathing in the mirror pool around the statue. This one is called "Parting the Waters." 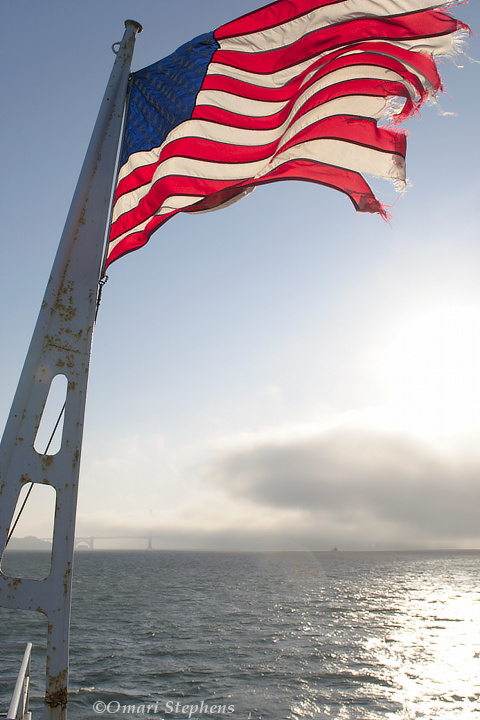 On the ferry-ride back to the city, this weather-beaten flag was whipping in the wind. I would have liked to have been able to shoot from higher, but I still like how this came out. I like how you can see the fog drifting past the bridge in the background. Finally, as we pulled into the port at Pier 41, I looked out of the doorway to see what docking looked like from the inside of a boat. 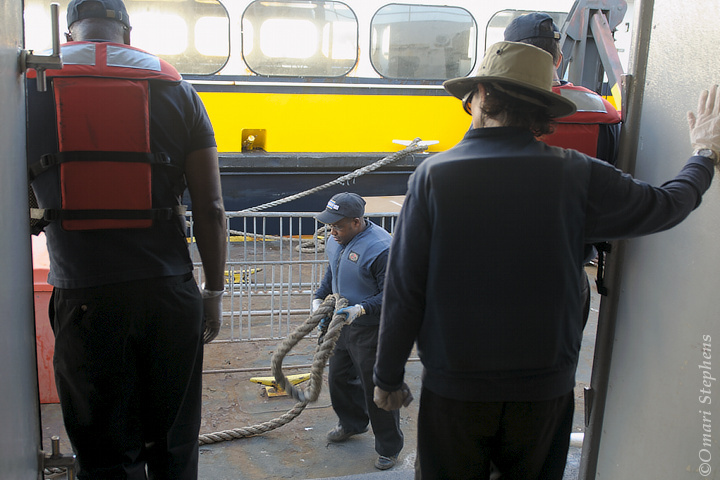 Seeing the size of the rope in the guys hands re-emphasizes just how much force it takes to keep one of these ferries anchored. Cool. "So, a bar walked into a man. Oops… wrong frame of reference." That statue is a 5 minute walk from my house. It used to be a tree that was in a raised, circular planter that we used to play tag around. Personally, I'm sad that the tree is gone. It was one of the things that they did while trying to make downtown tiburon fancy and high class rather than cool, like the good old days.